Zazzle Offers Custom Gifts Made by You – No More Boring Gifts! I am pretty dazzled after browsing around a site I discovered recently called Zazzle. Are you the creative type? Zazzle is a place not only to find unique gifts, you can create your own custom gifts too, right on Zazzle. Bring your unique vision to life with all of their customization tools. Make custom greeting cards, iPhone cases, wrapping paper, pillows, t-shirts, hoodies, ties, hats, messenger bags, phone cases, drink-ware, ornaments, belt buckles and much more. 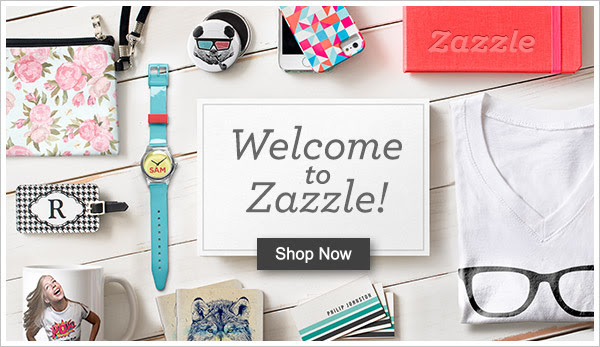 Zazzle offers millions of designs on hundreds of products, so there is something for everyone. No more boring gifts… Design a custom gift for maximum wow! One of my favorite options is designing your own custom wrapping paper. Do you have a special photo from 2014 that you would like to share? See all the customization options. How about designing a custom laptop sleeve? You can purchase a ready-made design or create your own! Be sure and see the options for paper plates, paper napkins, placemats, and tablecloths. You can also make a keepsake gift for all attendees. You can even sell your designs on Zazzle and reach more than 30 million monthly shoppers. There are hundreds of retail-quality products that you can design and tutorial and guides to get you going. Want to find a unique gift today? Look in their gift center for Gifts for Her, Gifts for Him, Gifts for Teens, Gifts for Kids, Gifts for Grandparents, and Gifts for Pets. You can view by price starting with under $20 and also see what their most popular gifts are for 2014. Take a Look During their Big Holiday Sale! Zazzle has a have a 100% satisfaction guarantee. If you don’t absolutely love it, they will take it back! Granted, I am hard to impress. I spend hours each day looking at deal sites . Zazzle is really a unique concept. If you have a creative kid, they will love designing their own custom gifts on Zazzle too!